Some time ago i had an idea about how different CPUs (mostly multi-core) can perform with Renoise, but also how good Renoise is actually running on multi-core CPUs in reality. Being without ideas and having no inspiration since long time, i decided to do something different than music. I wanted to do something, which could help other peoples wanting to upgrade their hardware to make it easy - based on “real live Renoise performance” and also just for fun ( “i do like copy/paste” ). Please download, test, have fun(!) and share your scores here if you like! I am really interested how i7 4790K will perform here. “ReBench.xrns” file starts from 1 track with 7 effects and finish at 160 stereo tracks with 960 internal effects on at once ( six effects on each channel ). No automation or devices in use - so making more complex and “real” project will affect performance probably, but even such a basic project and scenario should represent “reality”. Module saved under Renoise 3.01 64bits. Step1 : Load “ReBench.xrns” song. Step2 : Please wait - on some configurations it will take some time ( even couple of minutes ). 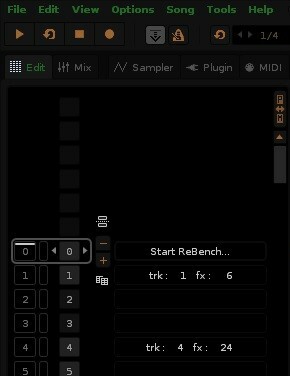 Then you can read position in pattern-sequencer when Renoise stopped. In this case ( above photo) it’s 26, so i would suggest to accept 25 as “last stable position”. 25 RPTS in this scenario means that your CPU can play and process : 25 separate tracks ( 25 stereo samples played together - one sample/note played on each track). Also - each track contains 6 dsp effects processing signal constantly + 1 effect on master channel. your cpu is capable to play and process audio project with 25 stereo tracks with 151 internal effects on in real time ( 25*6+1 on master channel ) - using primary DirectSound device with 10ms latency and other settings as listed above. Then you can change your CPU cores/t to maximum and test your CPU at full power! Some tests made last night attached! Great idea. I will test this with my i7 3770k, when I’m at home. 8CPU,latency 100ms : Ta! Amiga Rulez!!! P.S. cactoos: Greetings from Poland. I think it’s important that the power settings are set to 100% (that will be with any ‘turbo’ functions). As long with disabling any tools, and making sure the same visualisation settings are present. My default settings: Dithering enabled + 35 ms latency =Ta! Amiga Rulez!!! Renoise 3.01 32bit, Core i7 4770, OSX 10.9.4, 10ms latency, 44,1kHz, Firewire… maybe the range of test could be expanded ? audio starts to stutter at ~58 RPTS, although CPU is at ~72%… Strange… A bug in the OSX version? Intel i7 4790S 3.20GHz - 2CPU,latency 100ms : Ta! Amiga Rulez!!! Did you disable spectrum view? This is awesome, thanks for making it. So yeah, there you go. I can test the 2500K at stock if you are curious, but it has no problems overclocking to 4.6. Great Idea. Will test when home. 75ms (max. possible),44,1kHz,8 cores = 256 / EOF /Ta! Amiga Rulez!!! 8 Cores (100ms): Ta! Amiga Rulez!!! Would be interesting to know what kind of audio interface you people used while testing…? I just used my onboard sound so I am assuming my intereface doesn’t come into it? Yes, I think this is the fastest you can have, PCIe or onboard. Ok will do when I can (which may be tommorrow?) and will post results.